Imagine yourself in a dark, smoky blues club, a glass of whiskey in hand as you listen to the rich vocals of the songstress on the stage. 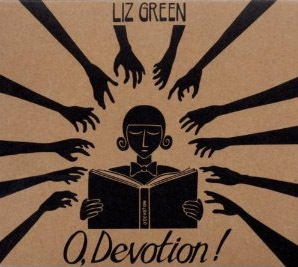 From the very first song on her debut album, that is just the image Liz Green evokes – she is a true lady of the blues. Taking inspiration from the story of Holocaust survivor Primo Levi, “Displacement Song” is an interesting mix of desperation and hope. Most songs are accompanied by a brass band – “Midnight Blues” and “Rag and Bone” are filled out nicely by the horns – while a guitar gets more emphasis alongside Liz’s haunting voice on the more simply arranged “Hey Joe,” a tale of a man done wrong who just keeps going back for more. The reason for her win of the 2007 Glastonbury Emerging Talent Competition comes shining through on O, Devotion! and this album of soulful vocals and lyrical stories will thrill any fan of blues and folk.